Born in 1905 in the center of the crumbling Austro-Hungarian Empire, Viktor Frankl was a witness to the great political, philosophical, and scientific upheavals of the twentieth century. In these stirring recollections, Frankl describes how as a young doctor of neurology in prewar Vienna his disagreements with Freud and Adler led to the development of "the third Viennese School of Psychotherapy," known as logotherapy; recounts his harrowing trials in four concentration camps during the War; and reflects on the celebrity brought by the publication of Man's Search for Meaning in 1945. Written in response to the horrors he experienced and witnessed during the Holocaust, Viktor Frankl's landmark book, Man's Search for Meaning, has sold millions of copies and been translated into twenty-seven languages. 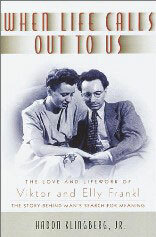 But although Frankl's thought and philosophy have been widely analyzed, until now little has been written about his life, and about the deeply loving, intensely spiritual relationship that led him and his wife to dedicate their lives to reducing pain and oppression in the world. In a book that is at once a wonderful love story and a tribute to two extraordinary people, Haddon Klingberg, Jr., draws on a wealth of anecdotes, told to him by the Frankls themselves, to describe their separate early lives and their fifty-two years as husband and wife. Returning to Vienna after spending three years in four different concentration camps, Frankl, whose first wife and family died in the camps, turned to writing as a way of finding some purpose in his life. But it was Elly Schwindt, a woman half his age, who helped him put the pieces of his broken life together. Married in 1947, the Frankls created a life of hope and faith, a life committed to proclaiming the oneness of the human family, challenging materialistic values, and encouraging the pursuit of meaning. When Life Calls Out to Us chronicles a spiritual journey infused with tragedy but sustained by love, wisdom, faith, and humor. Klingberg's extensive interviews, not available anywhere else, reveal the full richness of the Frankls' lives and beautifully illuminate their enduring contributions toward a better world for all people. HADDON KLINGBERG, JR., is a clinical psychologist and a professor of psychology at North Park University in Chicago. In addition to a Ph.D. from the Fuller Graduate School of Psychology, he earned a degree in biblical studies and studied with Viktor Frankl in Vienna in the early 1960s. For twenty years, he was president of Klingberg Family Centers in Connecticut. He lives in Evanston, Illinois. Zum 100. Geburtstag Viktor E. Frankls am 26. März 2005. Zentral war für Viktor Frankl die Frage nach dem Sinn des Lebens. Weltruhm erlangte er durch die Gründung der dritten Wiener Richtung der Psychotherapie, der Logotherapie/Existenzanalyse. Über 25 Jahre hindurch wirkte er als Vorstand der neurologischen Abteilung der Wiener Poliklinik. Er starb 1997 in Wien. Das Buch gibt Einblicke in Frankls persönliche Lebenssituation. Gegenstände, Einrichtung und sein soziales Umfeld zeichnen ein Porträt des unerschütterlichen Arztes, dessen ganzes Wirken dem leidenden Menschen galt. Anhand zahlreicher Begegnungen (u. a. mit Martin Heidegger, Arthur Miller) ergibt sich so ein facettenreicher Blick auf Frankls Umfeld, den Anekdoten von Eleonore Frankl ergänzen.